Beyond providing data for all 32 NFL teams, PFF also supports network broadcasters with game-preview packets that are used to enhance the in-game experience for fans and viewers. This Giants-Falcons preview features the same information our broadcast partners use for team research and in-game production. 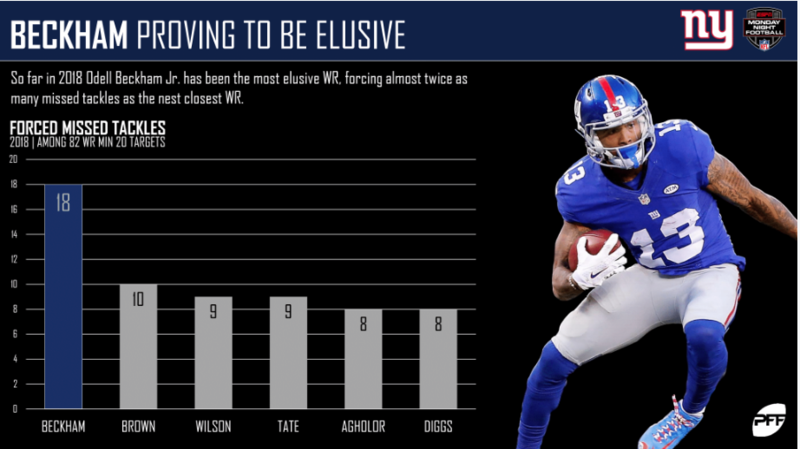 Six weeks into the season and Odell Beckham Jr. has been the most elusive wide receiver in the NFL. The LSU product has forced 18 missed tackles, eight more than the next closest receiver. While their record isn’t pretty, Giants fans can find comfort knowing that they field one of the NFL’s most explosive backs. 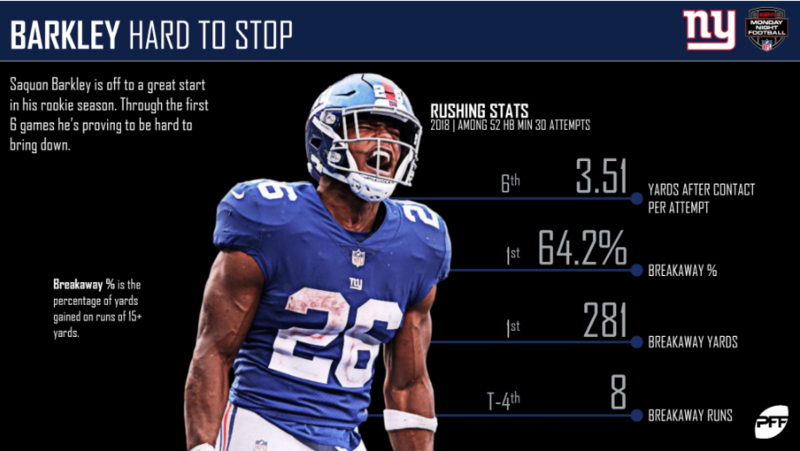 Saquon Barkley‘s breakaway percentage of 64.2% ranks first among 52 running backs with at least 30 rushing attempts. His 281 breakaway yards are the most in the NFL. 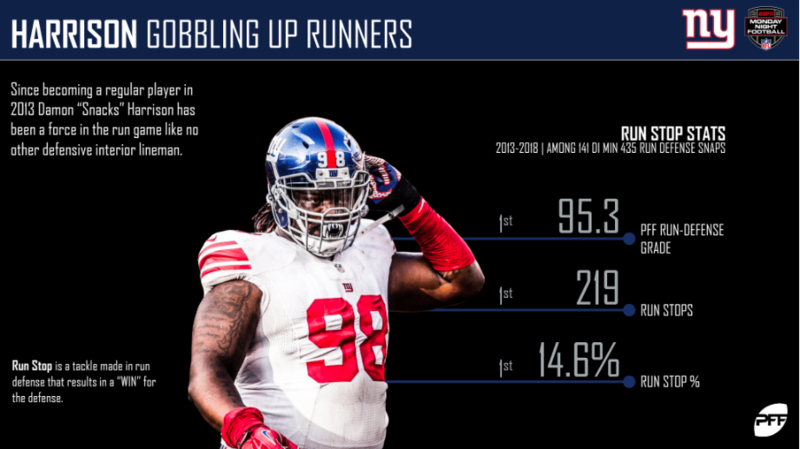 Damon Harrison has been the most dominant defensive lineman against the run since 2013. Since that year, he ranks first among defensive lineman in run defense grade (95.3), run stops (219) and run stop percentage (14.6%). 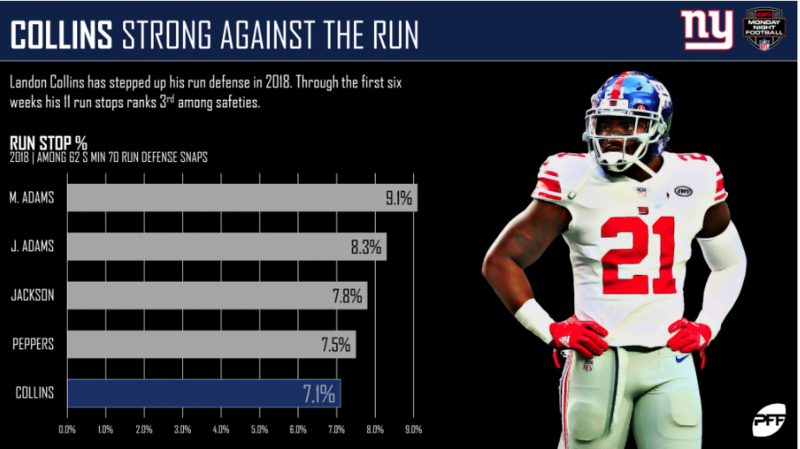 Safety Landon Collins has shown improvement in the run game this season. His run stop percentage of 7.1% ranks fifth among safeties, while his 11 total run stops rank third. 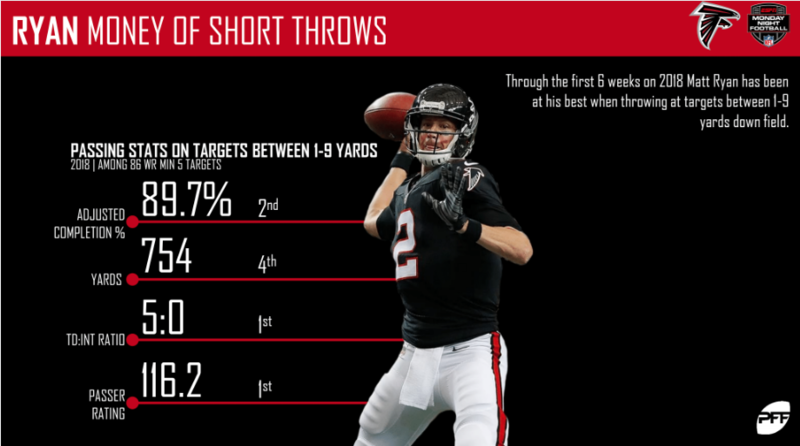 Through the first six weeks of 2018, Matt Ryan has been money on short throws (targets between one and nine yards). Ryan boasts the second highest adjusted completion percentage on short throws (89.7%) and has fielded the league’s highest passer rating (116.2). 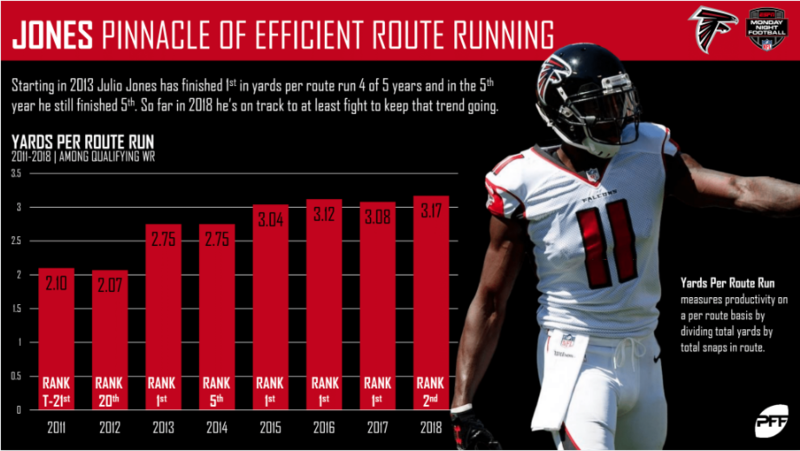 Since 2013, Julio Jones has been the gold standard when it comes to wide receiver efficiency. Jones has finished first in yards per route run four of the past five years. His current yards per route run of 3.17 ranks second among receivers. Will he make it five of six? 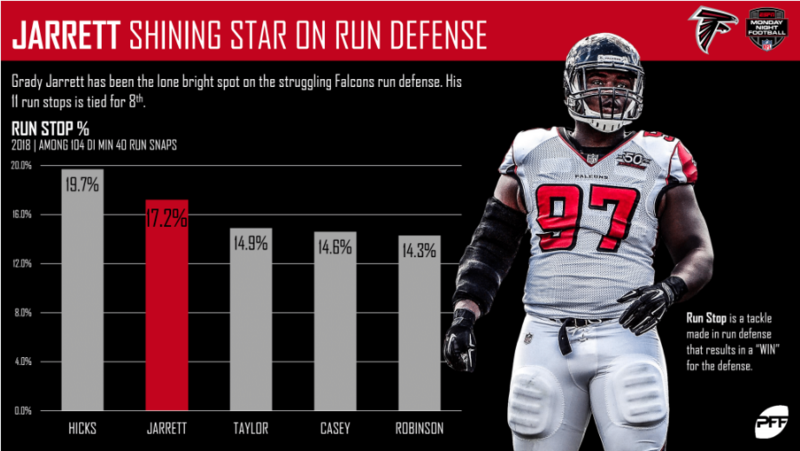 If there has been one positive to take away from the Falcons’ defense this year, it’s been the play of Grady Jarrett. Jarrett’s performed well against the run this season; his 11 run stops are tied for eighth among defensive lineman. 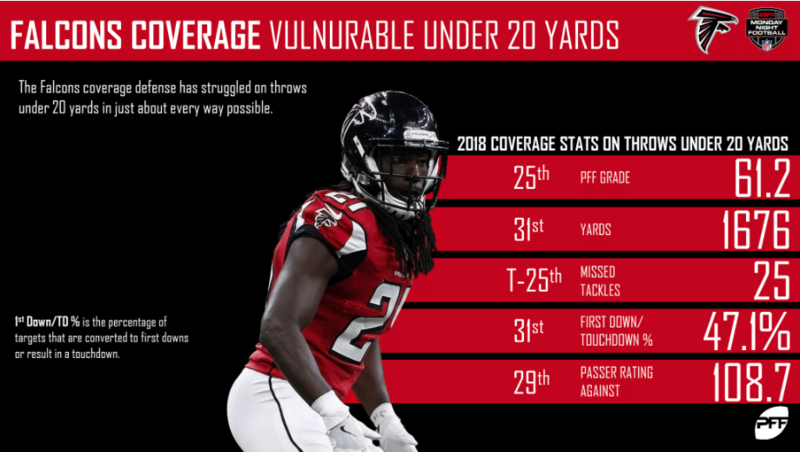 Falcons defense: Struggling in coverage? The Falcons pass defense has struggled this season, especially when it comes to throws under 20 yards. They’ve allowed 1676 yards on such throws, second-most among teams this season. 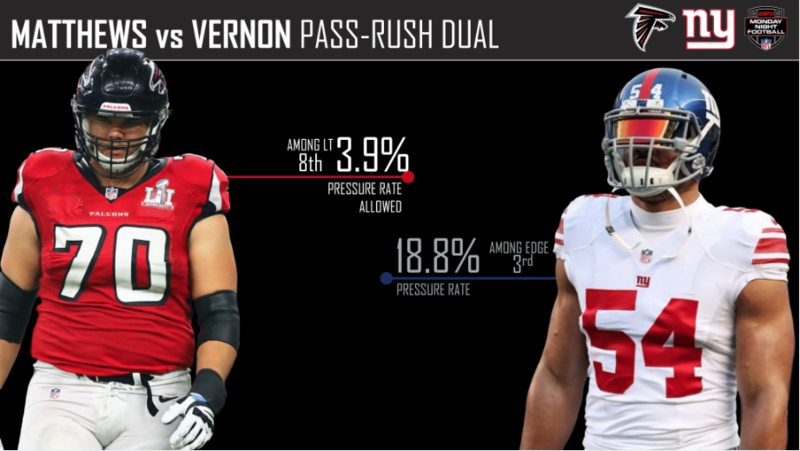 PFF Greenline has projections for the spread, moneyline and over/under of the Giants’ matchup with the Falcons. Get its picks here.